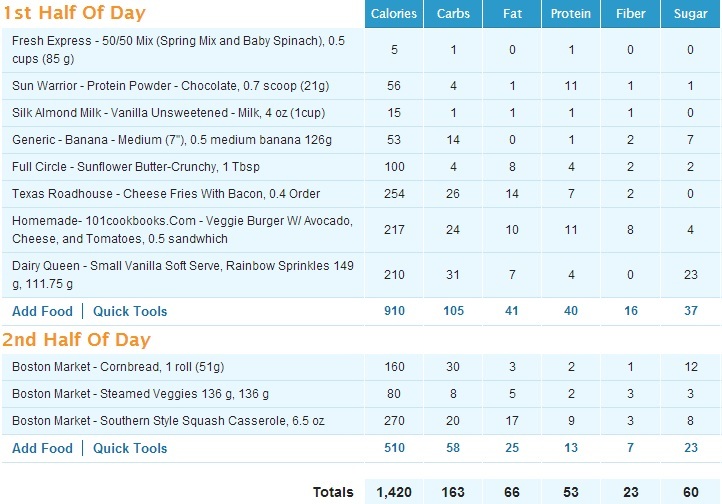 A calorie-counting, group fitness class-going, dessert-loving vegetarian gal sharing with you the food i 8 today and every day! I used to eat nothing before working out in the morning. I would just wake up, get dressed, head to the gym. Then someone tipped me off that it’s not so great to workout first thing in the morning on an empty stomach after you’ve been “fasting” for 6-8 hours. So, I started eating a spoonful of almond butter before working out. Then I started wondering if that was the best pre-workout snack…I looked around online and realized it’s not the greatest! (since it’s high in fat, it’s harder for the body to digest before or during the workout). After much research, I decided that a piece of toast with some sort of spread would be best for me. 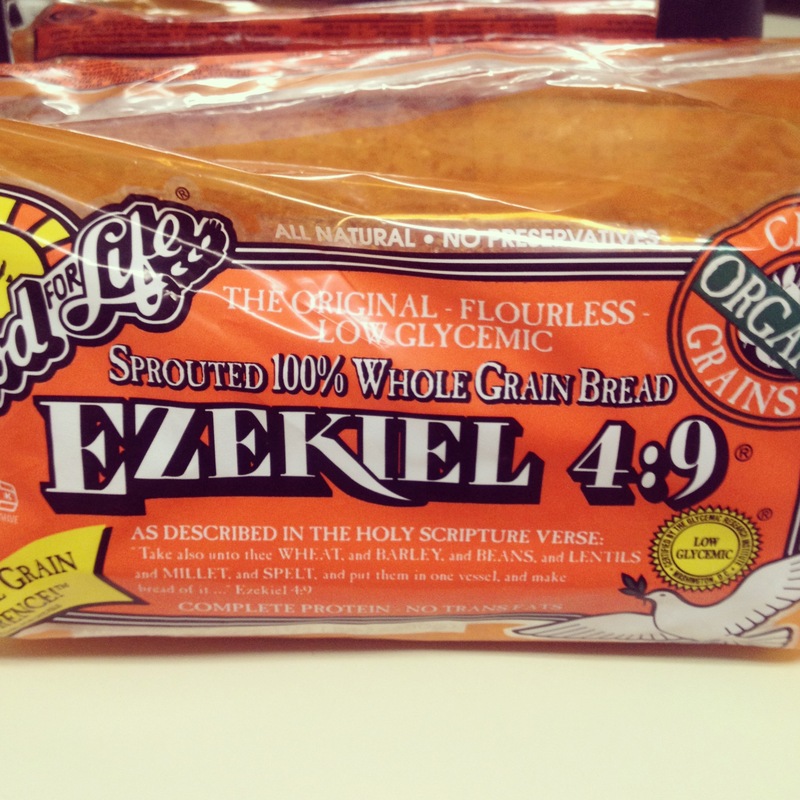 I decided to try a bread that I’ve seen in blogland for quite a while now–Ezekiel bread! Lots of bloggers SWEAR by this flourless bread and for many, it’s the only bread their family eats, so I figured I’d give it a try. Now, it comes frozen, so I researched the best method to have it, and many suggest just sticking it right in the toaster, which is what I did. 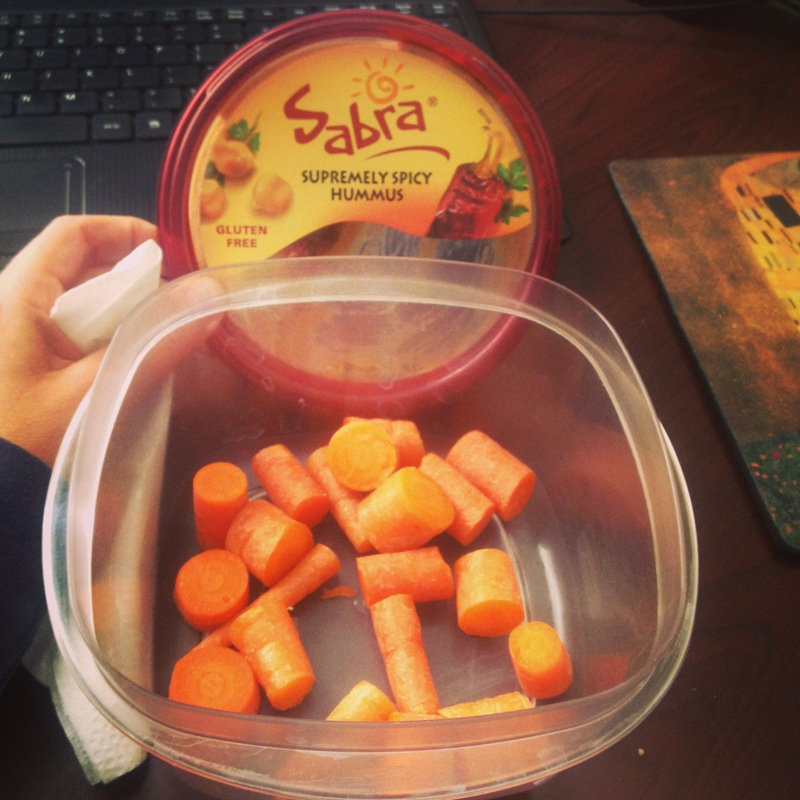 I also spread some Sabra hummus on top, and it was the perfect pre-workout snack! 🙂 The bread tasted normal to me, nothing outstanding or disgusting, but I know that it has added benefits, which are discussed here. 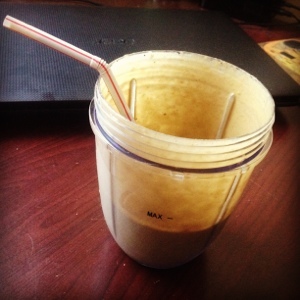 As for my post-workout fuel, I went with old faithful–a Sun Warrior chocolate protein shake. 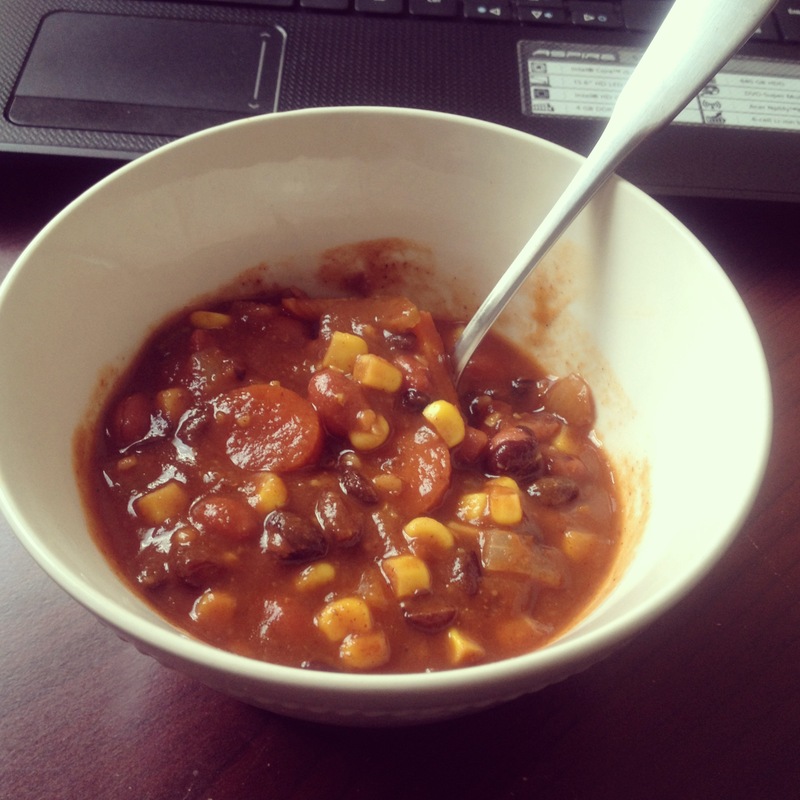 Later in the afternoon I had some more of my homemade red and black bean soup…yum! 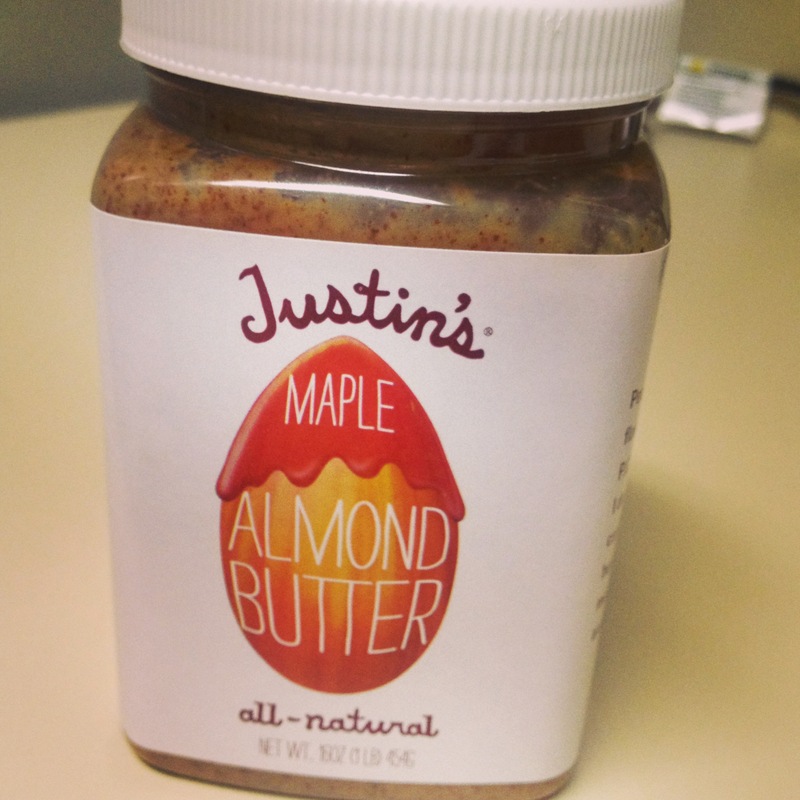 Later in the afternoon, I had a spoonful of Justin’s almond butter. For dinner, we went to a mongolian grill place. 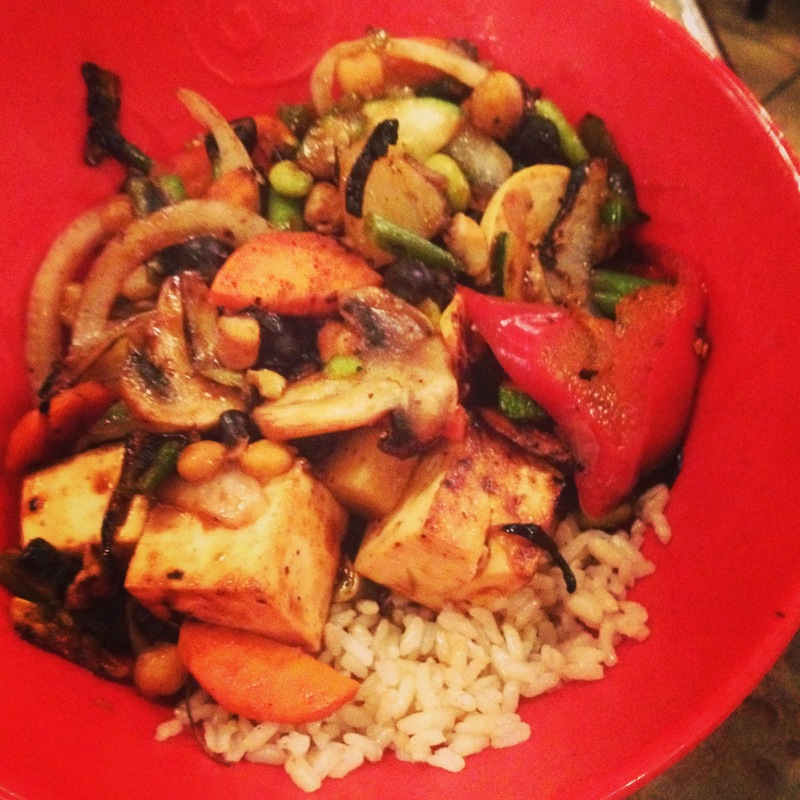 I got a mix of veggies, tofu, teriyaki sauce, and brown rice. Late night snacks were two-fold: (1) 1/2 banana, 1TBSP Justin’s almond butter, coconut, and (2) slice of cake from Publix…again! 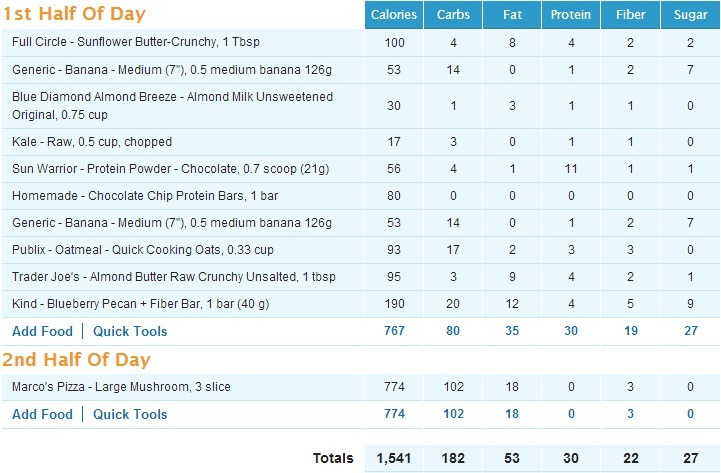 I’ve definitely fallen off the “no-dessert” AND the “minimal-dessert” wagon. I’ve been in SUCH a dessert mood lately! At least the rest of each day I’ve been on track. 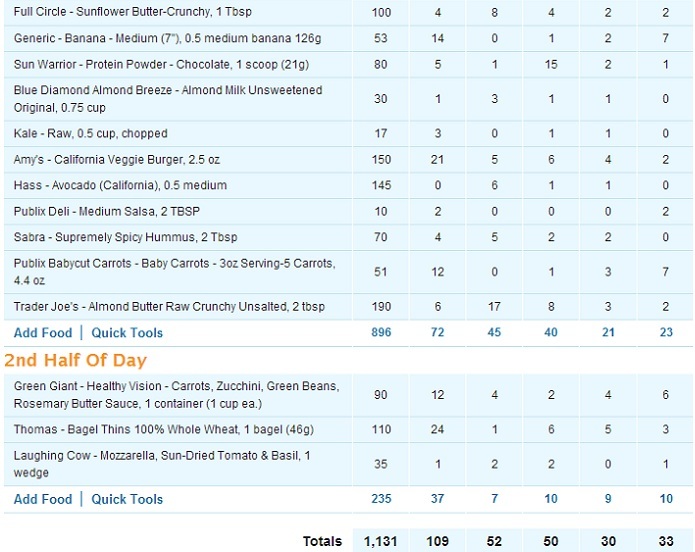 Today I woke up hungry, so I ate a spoonful of almond butter before hitting the gym. 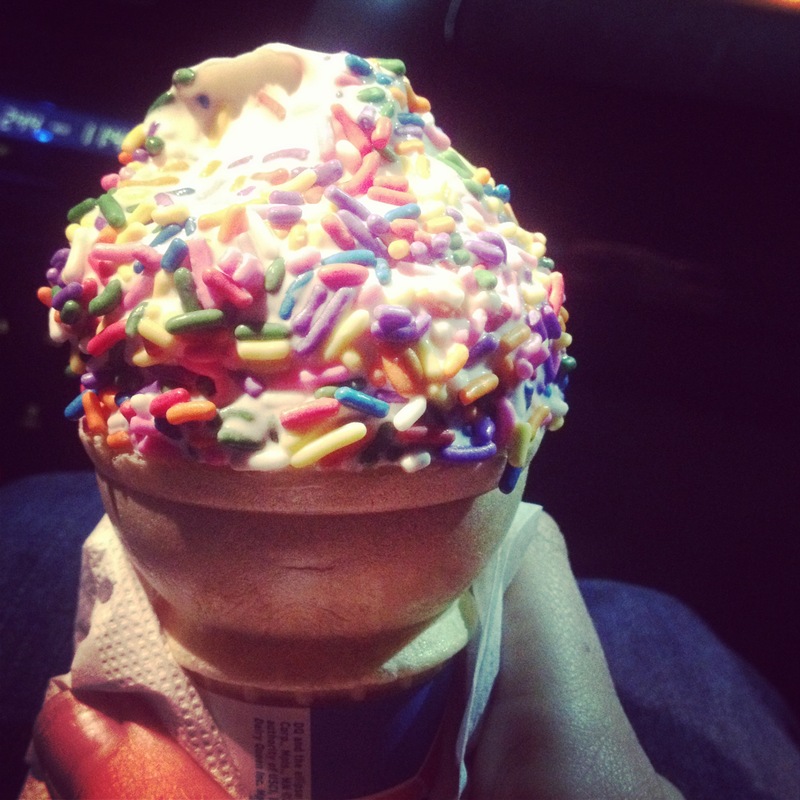 Afterward, I had a special treat in store for myself, haha. 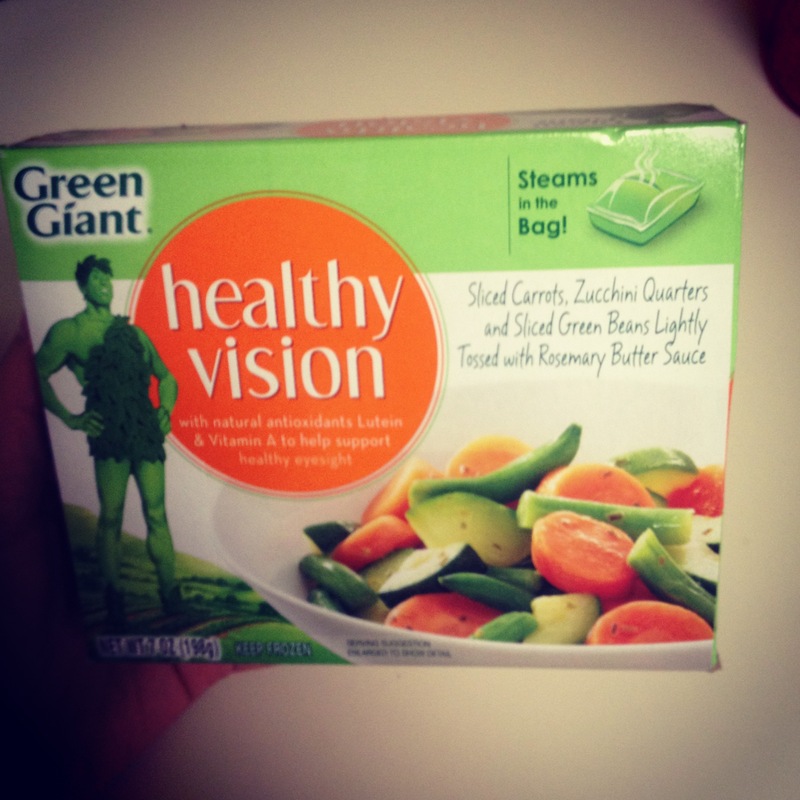 Instead of my normal protein shake, I tried something new (to me). Ever since entering the healthy living blogworld, I’ve read SEVERAL posts about either: (1) overnight oats, (2) oats in a jar, dubbed OIAJ, or (3) overnight oats in a jar, dubbed OOIAJ. Well, I had a near-empty jar of sunbutter that was just begging to be used for this experiment! At first, I thought it was kind of runny. 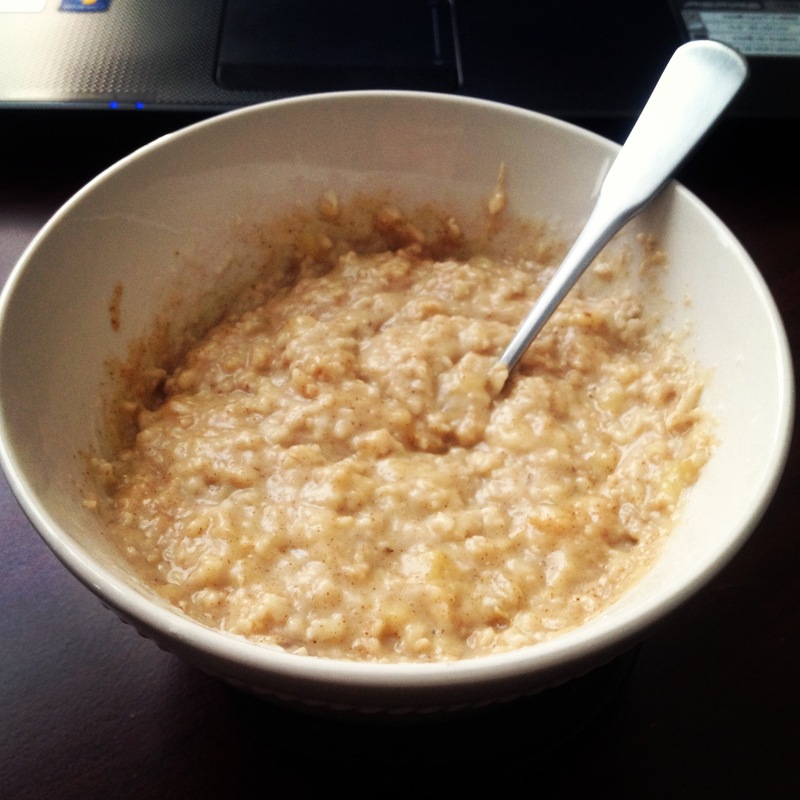 I’m used to the consistency of oatmeal, and this was much more “liquidy”. After a few bites, though, I got used to the consistency. Overall, it was DELICIOUS! Next time I might just do 1/3 C almond milk. I will definitely be making OOIAJ again, though! …or just plain old overnight oats, hehe. Ok, later in the day I had another spoonful of almond butter, but I finished my Trader Joe’s jar and moved onto another jar of Justin’s Maple almond butter! I am reunited with my one true love. ❤ This is all getting very dangerous. 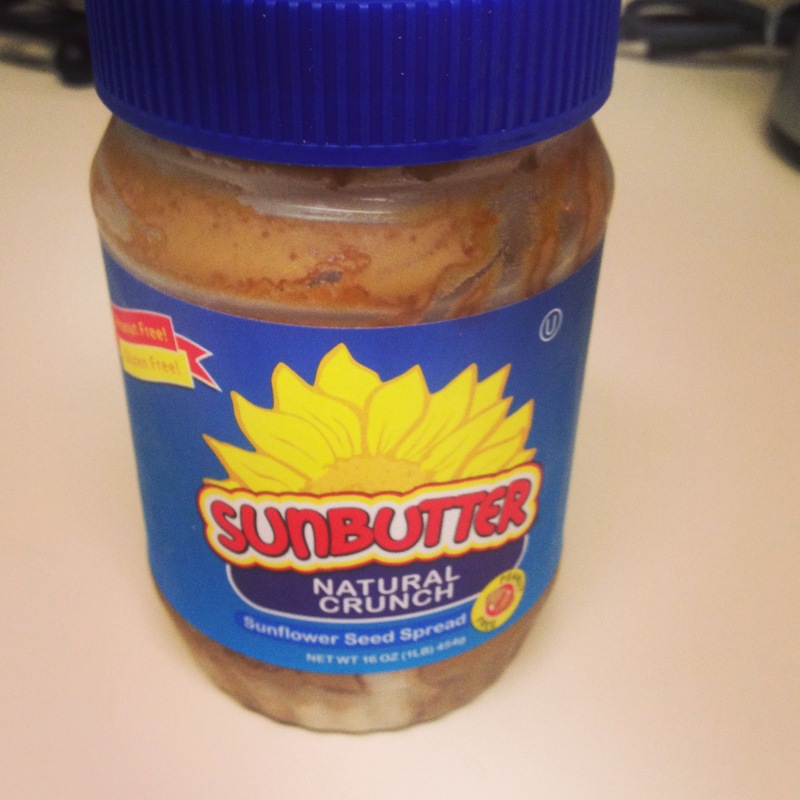 I think I am on the verge of a nut butter obsession. Tonight’s dinner included a night out with the gals at a local Greek/Lebanese restaurant that we’ve been meaning to try, and finally found the time to do so. Although I didn’t take pictures, I had a delicious falafel platter and a piece of baklava for dessert. The falafel was awesome, but sadly the baklava was a waste of my dessert calories! Oh well, you live and you learn. I had to at least try it. 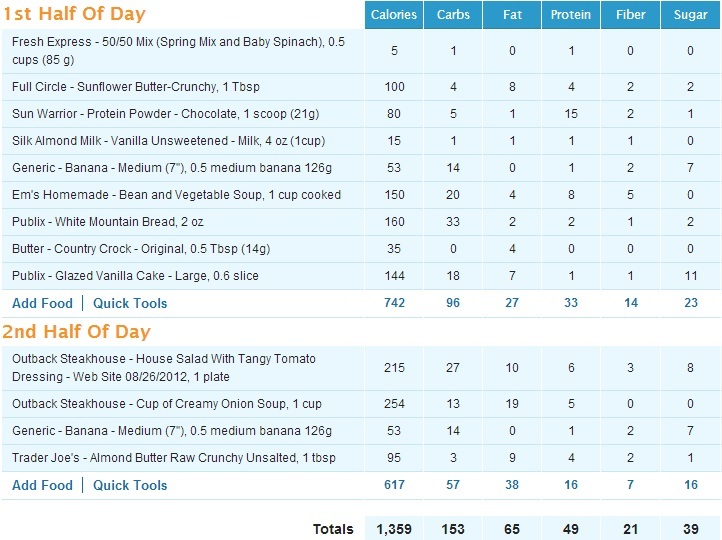 Today’s eating begain with a spoonful of almond butter before heading to the gym to get my sweat on! Afterward, I dove into a delicious protein shake. Then I decided it was HIGH time I make a batch of something bean-based to get me through the week. I went with a recipe from allrecipes.com called Heddy’s Black and Red Bean Soup, mainly because I had a lingering can of red beans I needed to use up. 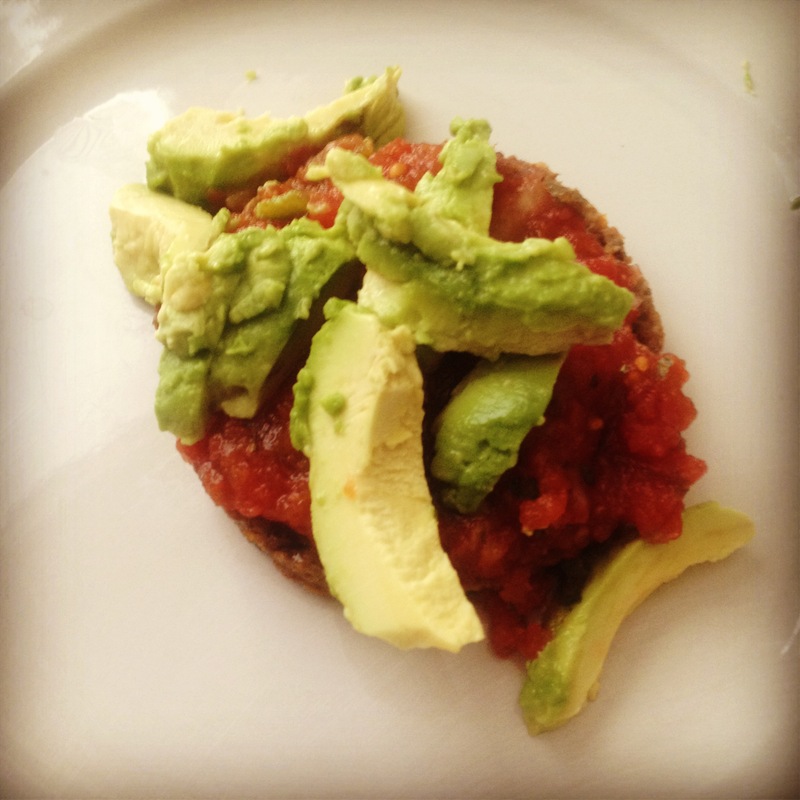 The recipe was super simple, and the end result was quite tasty! I wouldn’t say it was TO DIE for good, but it was good, and it’s hearty. I would make it again. 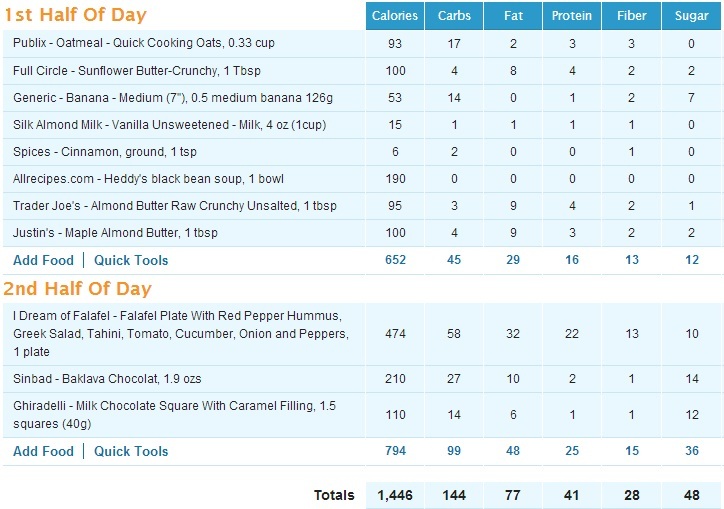 I added the calories from all the ingredients together, and it comes to 1135 calories. 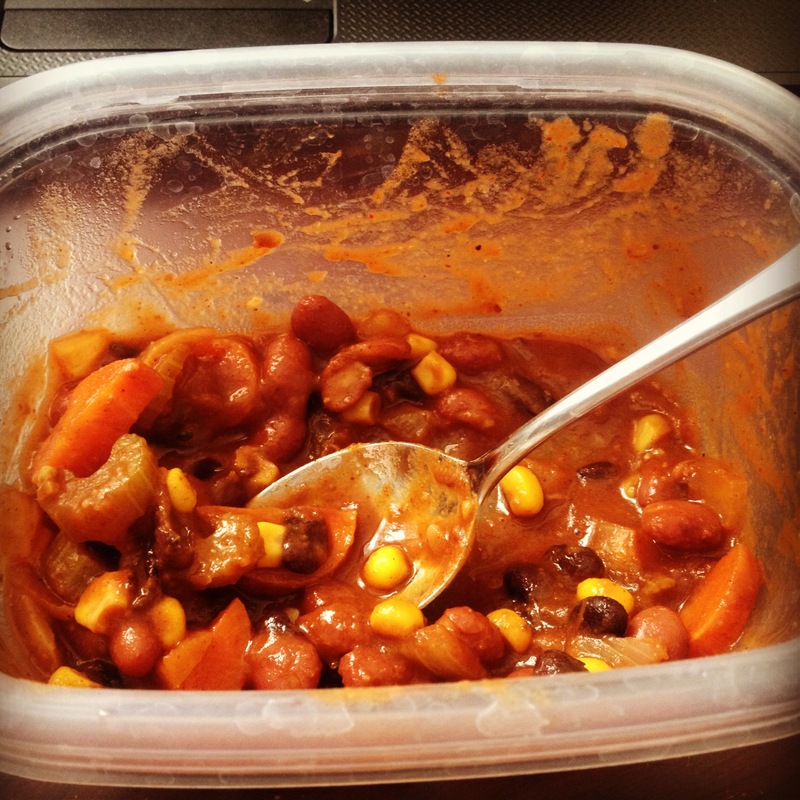 I split it into 6 portions, so each serving is roughly 190 calories. Not too shabby! 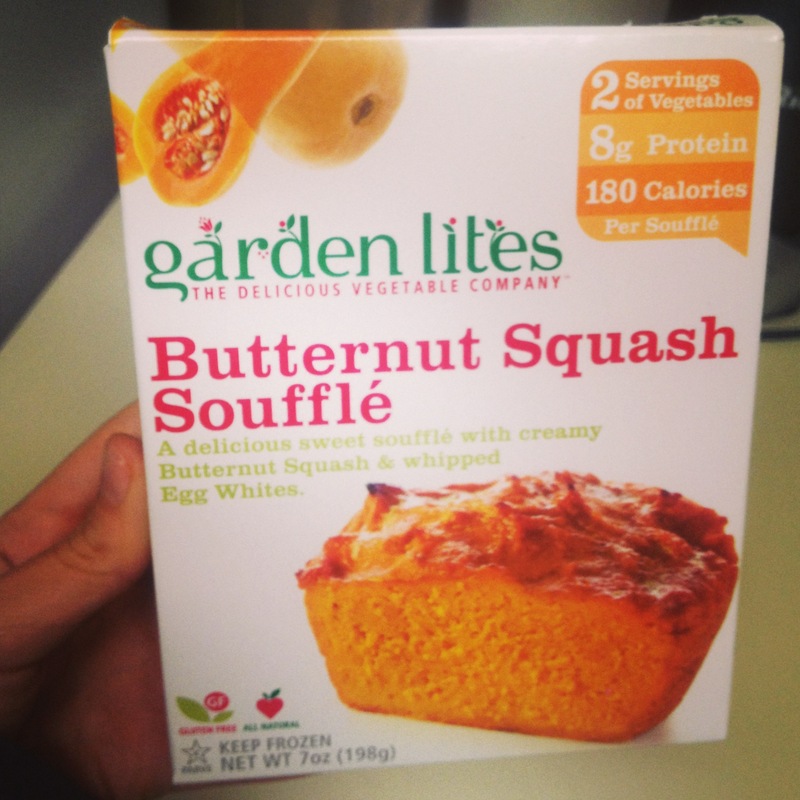 Later in the afternoon, I had the last Garden Lite souffle I had stashed in the freezer. 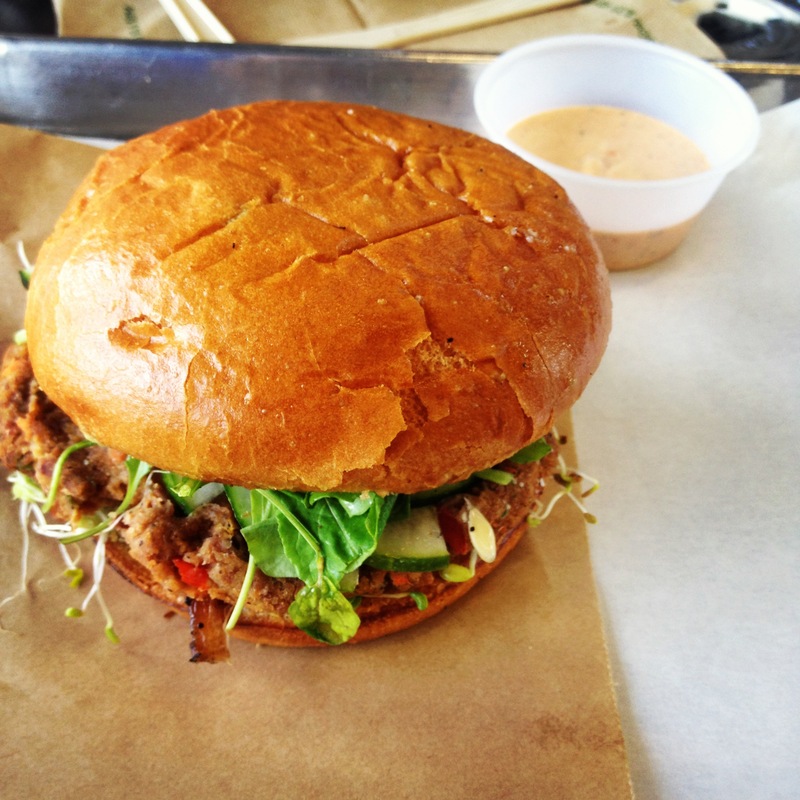 Then for dinner we hit up ANOTHER burger joint in town (we also went for burgers Saturday afternoon). 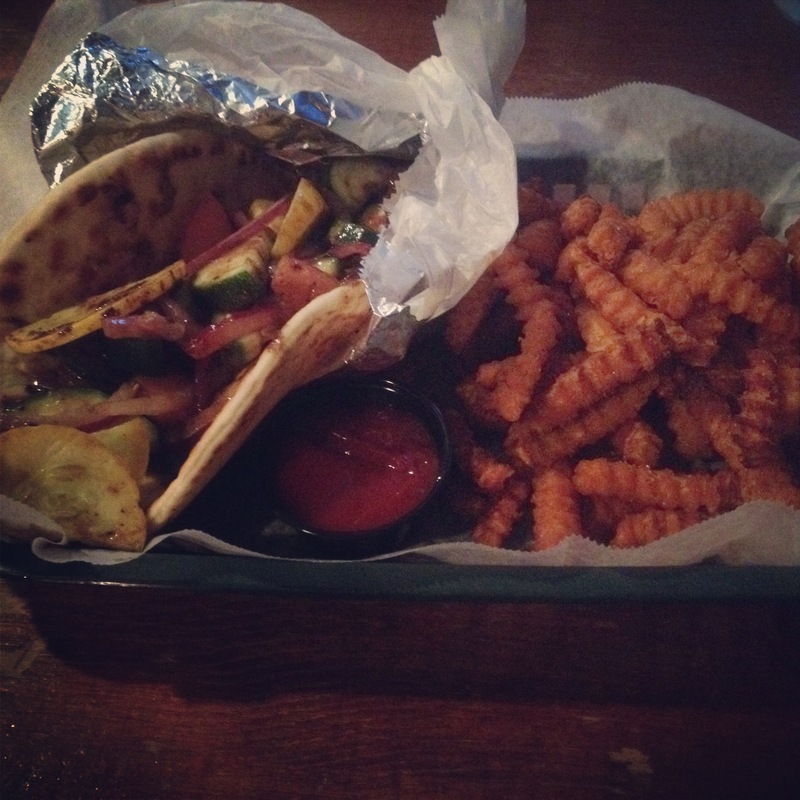 This time I went with a veggie pita and sweet potato fries, although I only ate half of the pita and less than half of the fries. 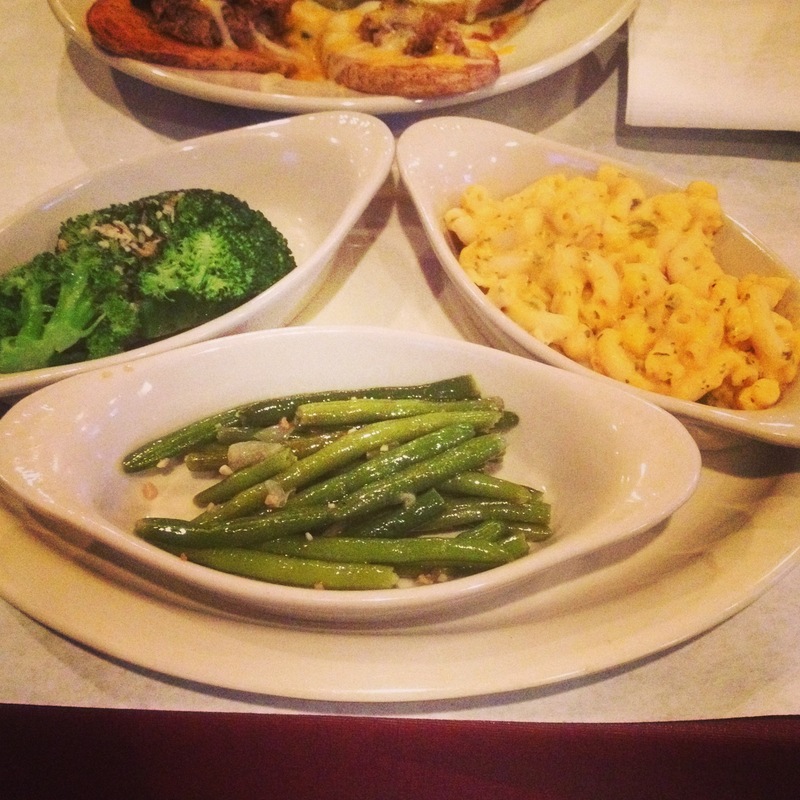 Big portions! Next up, yes…once again…I ate dessert! 😦 So naughty! We went to Publix to pick up a RedBox movie, and I just couldn’t resist. Well, at least it was delish! Today was busy, busy! It began with a 5:30am alarm, 6am spin class, and a Body Attack class. After the gym, I downed a protein shake on my way to campus. I attended a 2-hour workshop, downed a Naked Green Machine juice, attended a presentation, wolfed down a Lara bar, and then joined in on an after-work happy hour (h2O on the rocks with a twist of lemon, please!) hehe. I was STARVING when dinner time rolled around. 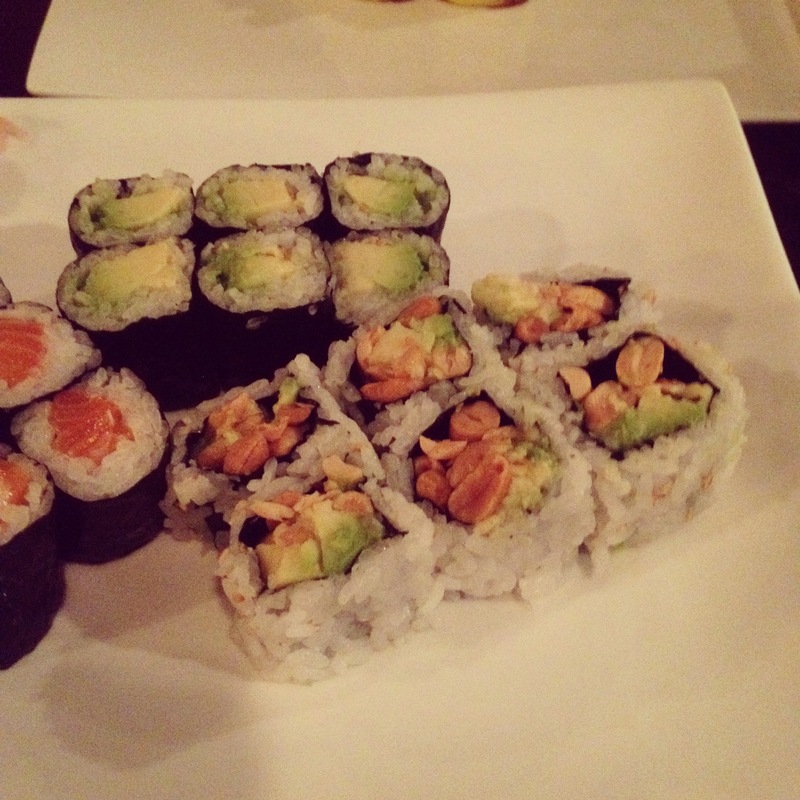 We went out for sushi, and I ordered two rolls–an avocado and an avocado + peanut roll. Delish! I was still a little low on calories after dinner since I burned so many calories at the gym today, so what better way to boost my food calorie count than with something sweet?! Since I got back from my vacation on Monday I haven’t seen the scale dropping like I’m used to. 😦 I’ve been working out like a crazy woman, keeping my calories in check, and still it hasn’t really wavered. 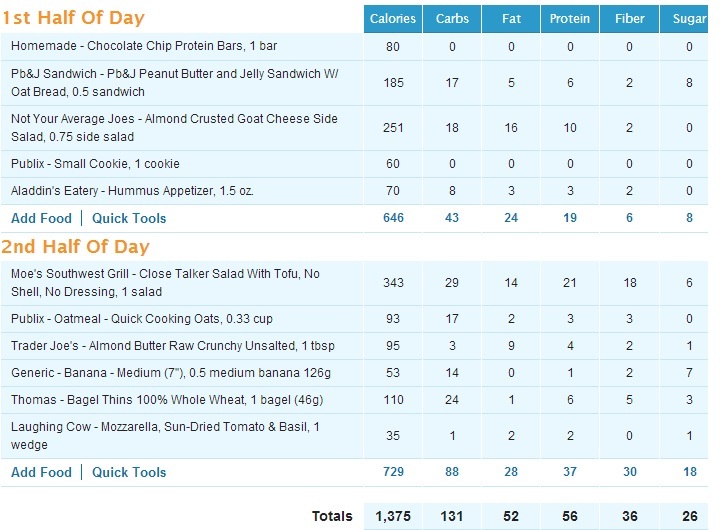 Although I’ve had a few bad food choices mixed in there (some white bread, dessert, and pizza), I haven’t gone crazy with the junk at all. Le sigh…here’s to a better week and getting along with the scale! 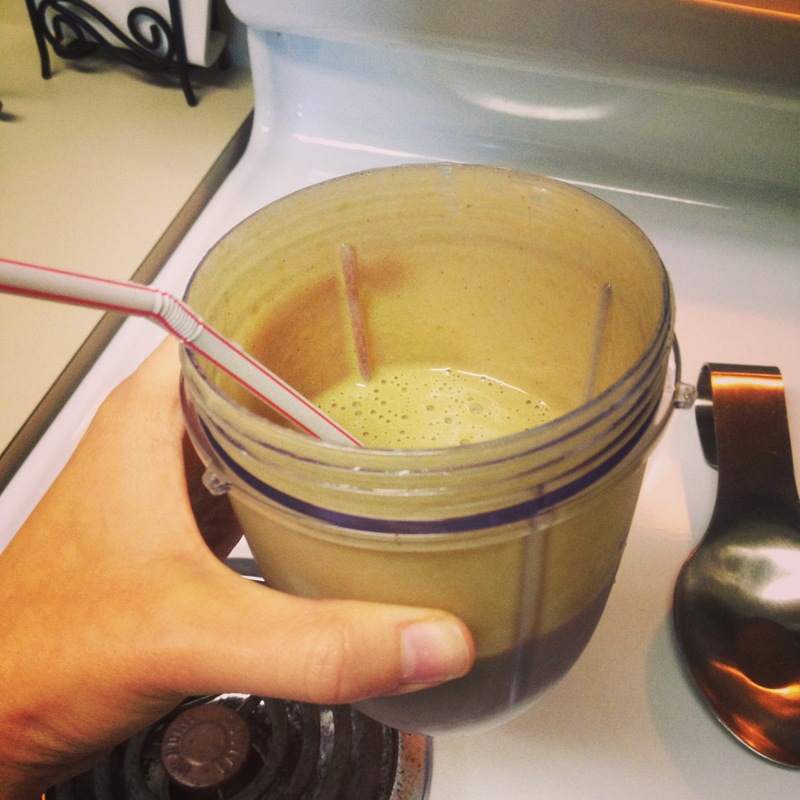 Even though I didn’t work out this morning, I still started the day with my favorite protein shake! Later in the morning we drove a couple hours to my husband’s family’s for lunch followed by a family photo session. The lunch was simple–soup and sandwiches. After the photo session, we took my brother-in-law to dinner at Outback Steakhouse for his big 3-0! Then, we made the drive back home. I was feeling a little hungry, so I whipped up a banana + almond butter snack. And now I’m calling it a night! I have an early spin class scheduled, so I need to start winding down soon. Gotta get a good night’s rest! 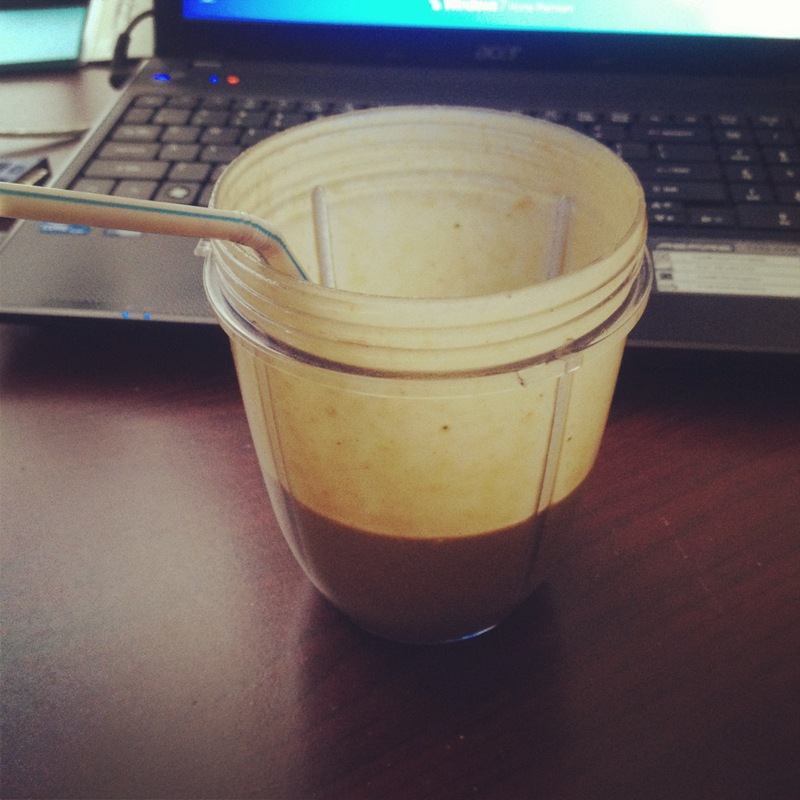 This morning started out healthful with a great workout and a protein shake. 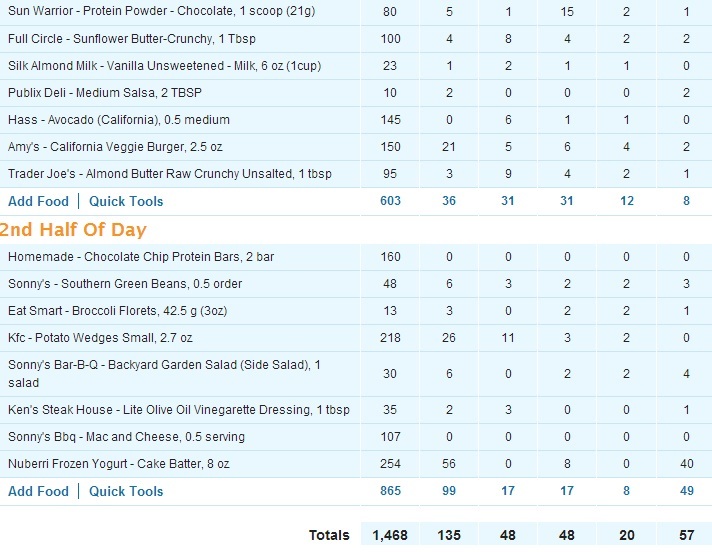 …I also ate nearly half an order of cheese fries. eeek! It was too shameful to post a pic of the greasy, cheesy, fatty fries on here, haha. After that naughty meal, I actually did alright with dinner. 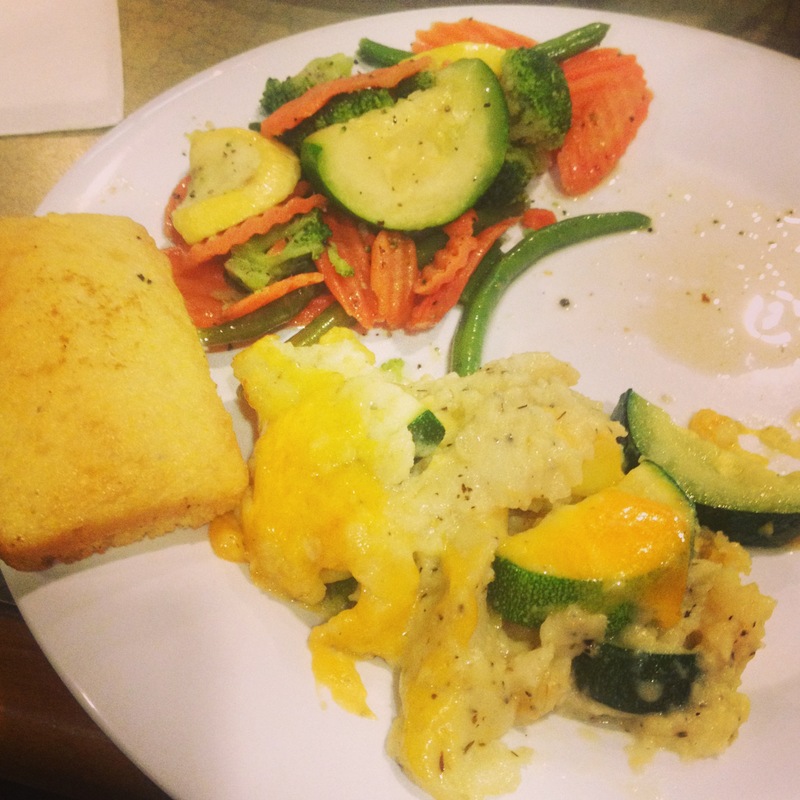 We hit up Boston Market, and I just got two veggie sides and a piece of cornbread. 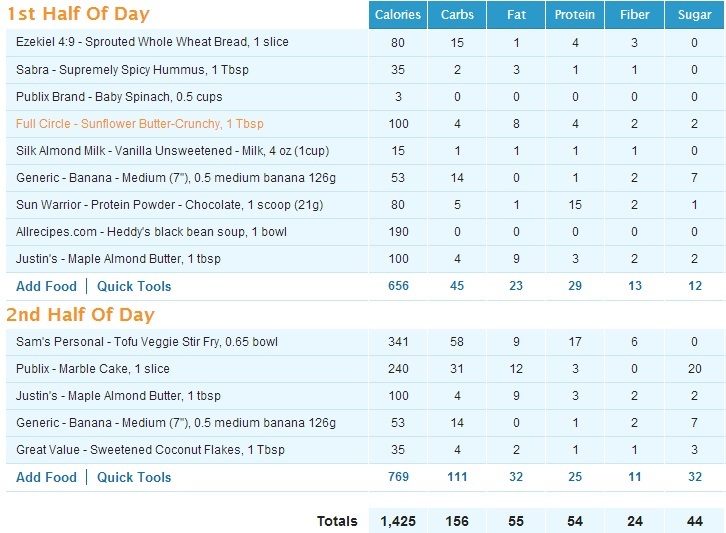 In sum, while today did entail a big ‘ol white bread hamburger bun, greasy cheesy fries, and an ice cream cone, I didn’t go too crazy on the calories. I guess that’s one positive! Onward! So, at about 10am I finally ate something. 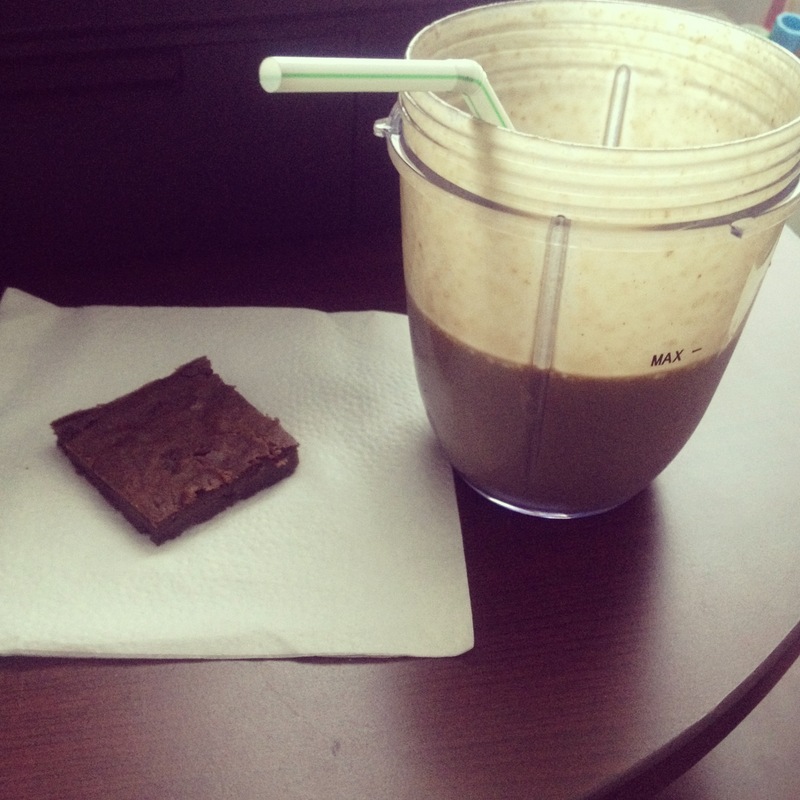 My protein brownie for breakfast! Now, don’t get confused. They’re not great. They’re actually not really even good. I’d label them “ok” still. Lunch today was a work one at a local restaurant where I ordered a salad and sandwich combo. No pics, sorry! But the salad was a delicious mix of greens, goat cheese, and pecans. The sandwich was a “gourmet” PB&J, which tasted like a normal PB&J to me. 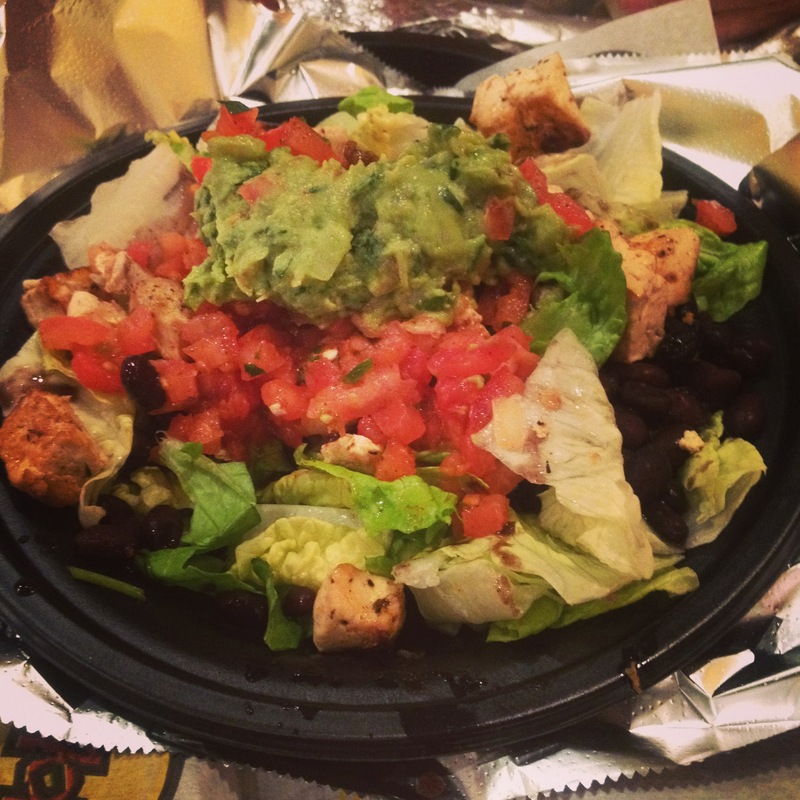 On the menu for dinner tonight…Moe’s! 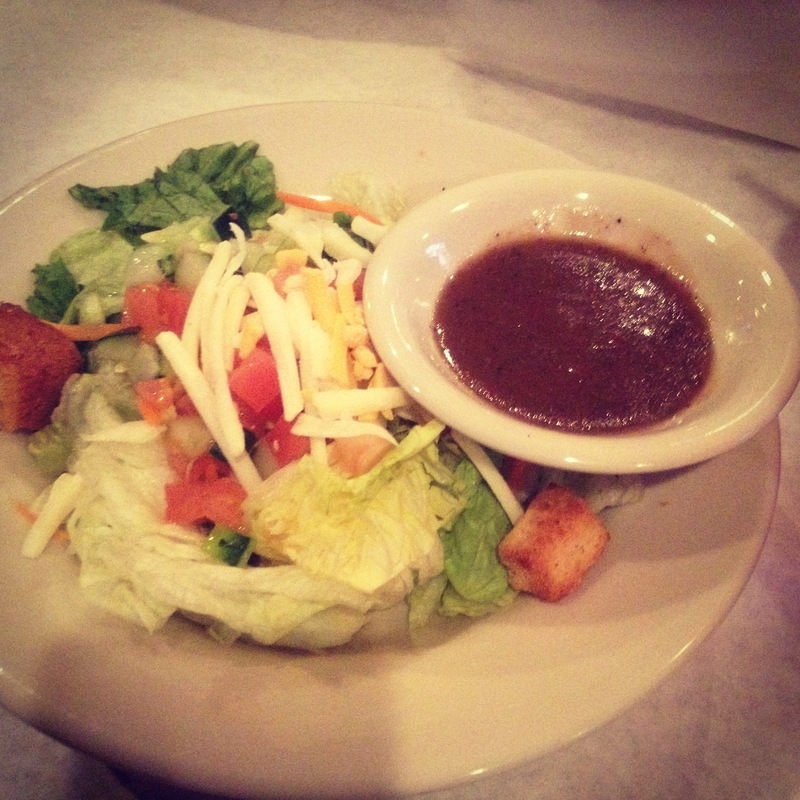 I went back for the tofu taco salad–so good! Really hit the spot! We had a bowling night with friends this evening, so I downed a bowl of oatmeal before going so that I wouldn’t be tempted by french fries and pizza at the alley. I just got home from a great night of fun, but I’m feeling a little snacky, so I had a bagel thin with some cheese spread. Great day! Today I woke up for an early Pilates class. I’ve never tried Pilates, and with good reason. My core is not the strongest (damn you, planks! ), and I have zero flexibility. Thankfully, they turned down the lights during the class, since I am surely the weakest link in Pilates. At least I tried something new! 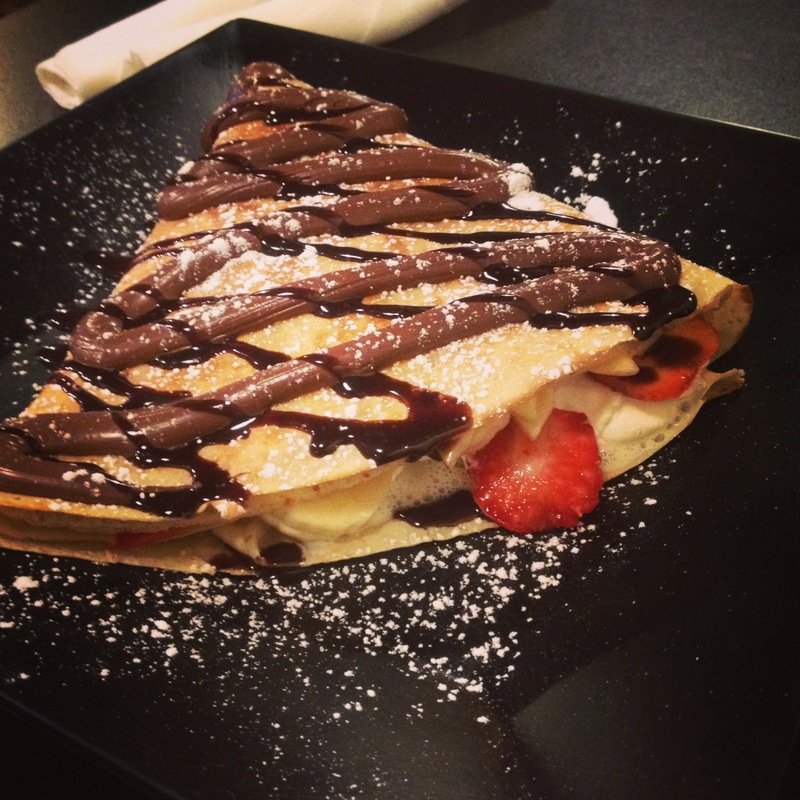 For breakfast…protein with a side of protein! 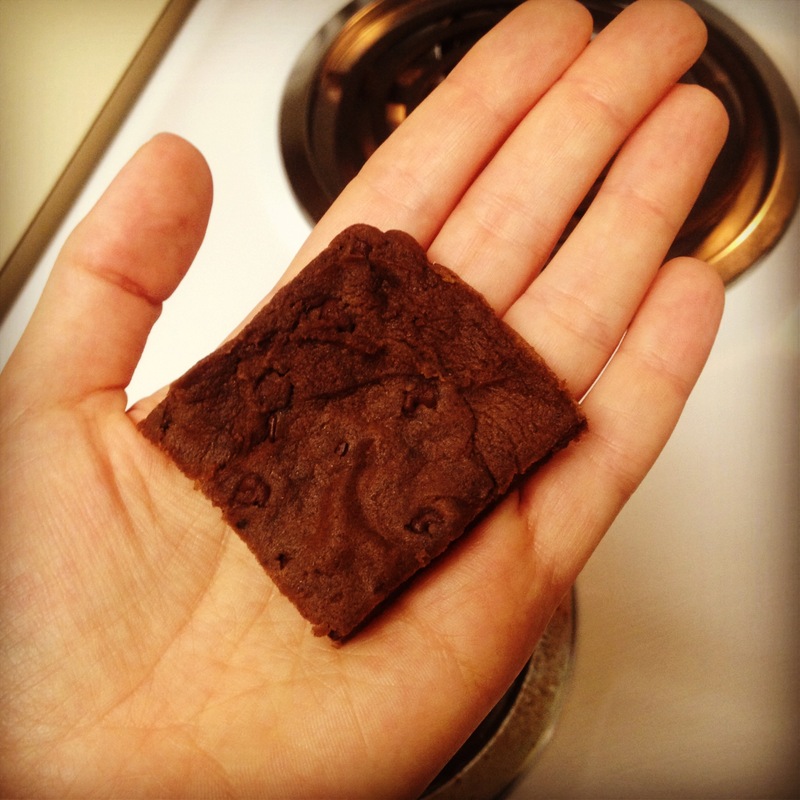 Yes, having a brownie for breakfast seems a bit strange, but it’s a protein brownie! I contemplated throwing away the entire batch yesterday since it’s not something sweet that I would look forward to each night (which was the whole purpose of baking them), but then I thought I could suffer through them for breakfast at least. Not too bad on day #2, actually. 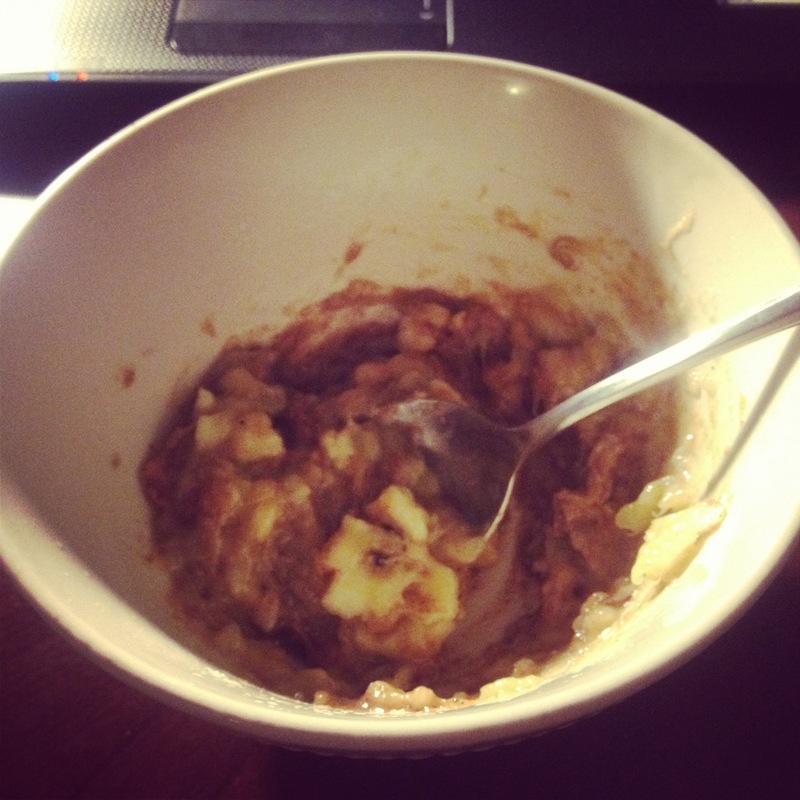 For lunch I had some hearty oatmeal with almond butter and banana. 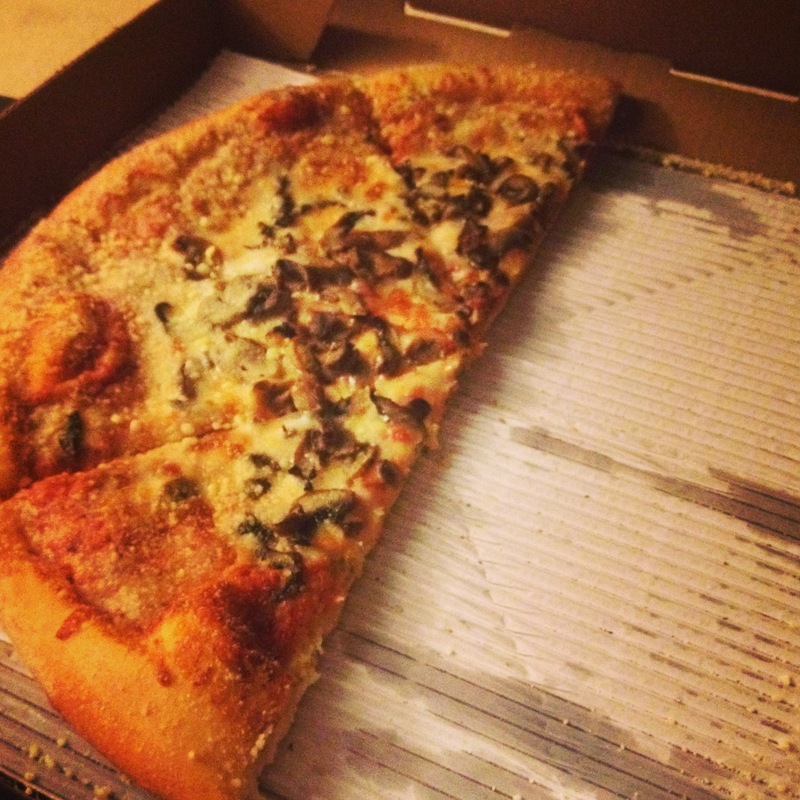 I was absolutely starving after my evening workouts, so we picked up a Marco’s mushroom pizza–yum! It really hit the spot. I needed some fuel after all those workouts. Yes, I should have had something a tad bit healthier to round out my day of excellent fitness, but I caved. And it was delicious. Today I downed my spoonful of almond butter before hitting the gym. 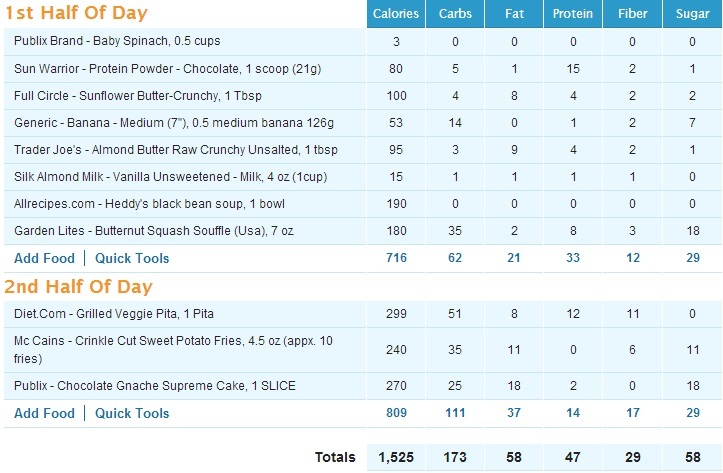 When I returned home, I downed a modified version of my typical protein smoothie (just the protein powder, almond milk, and sunbutter)…definitely not as delicious as my usual mix that includes kale and 1/2 a banana. I’ll be going back to that tomorrow! Lunch today looked much the same as yesterday. 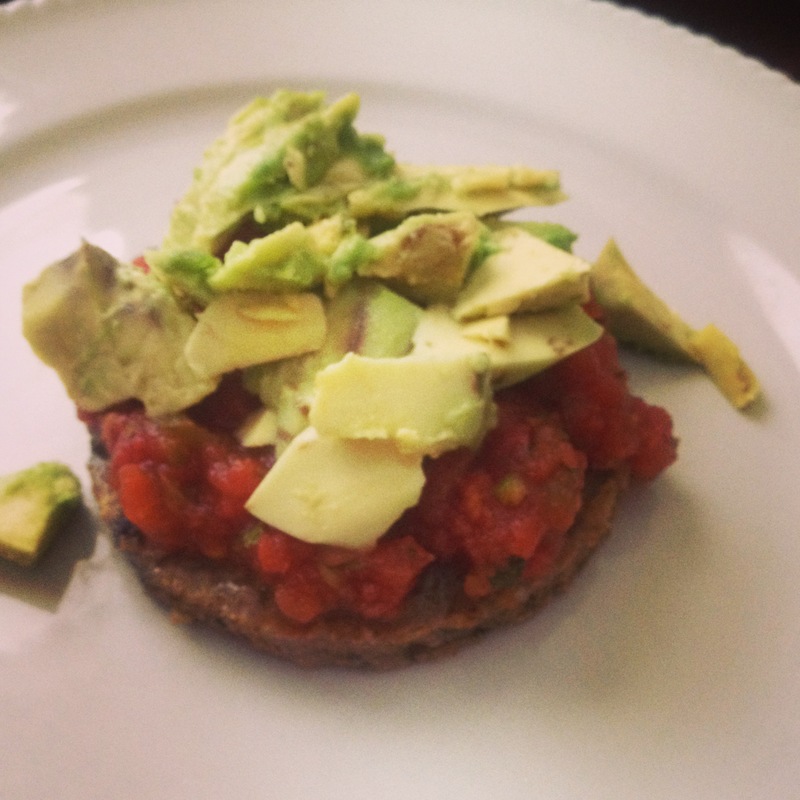 An Amy’s veggie burger, 1/2 avocado, and salsa. 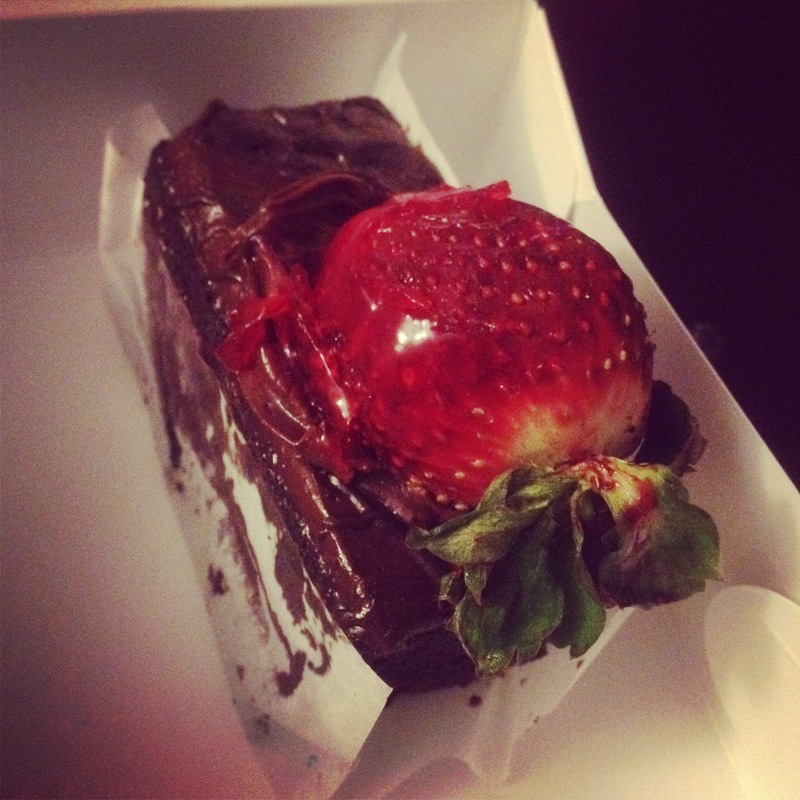 Since I’m trying to be “good” and follow my rules during the day, I’ve been craving something sweet at night…kind of like a reward for myself. Something to look forward to all day long to keep me on track. So, in the early evening I attempted to bake something. 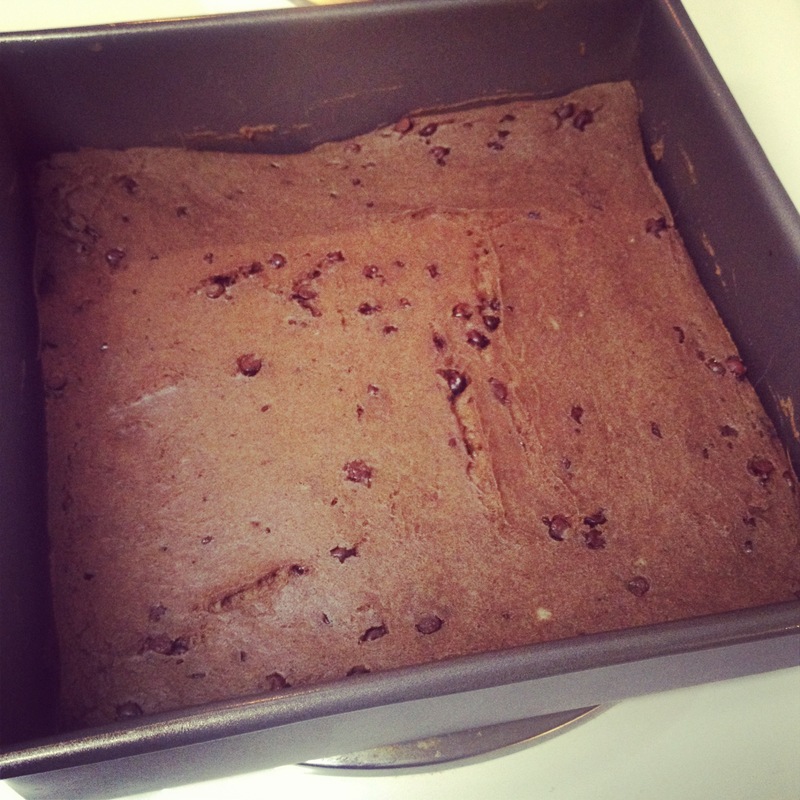 That something, in particular, was a recipe from Carrots ‘n’ Cake called Chocolate Chip Protein Bars. Well, the only differences between my ingredients and hers are that I used a vegan protein, and I used the chocolate (instead of vanilla) flavor. So, mine turned out looking more like brownies than chocolate chip bars. In other news, tonight we checked out a new BBQ place in town, and I got a delicious side sampler (and my husband’s house salad). Good thing I’m still going crazy at the gym! I’ll burn it off tomorrow, right?! 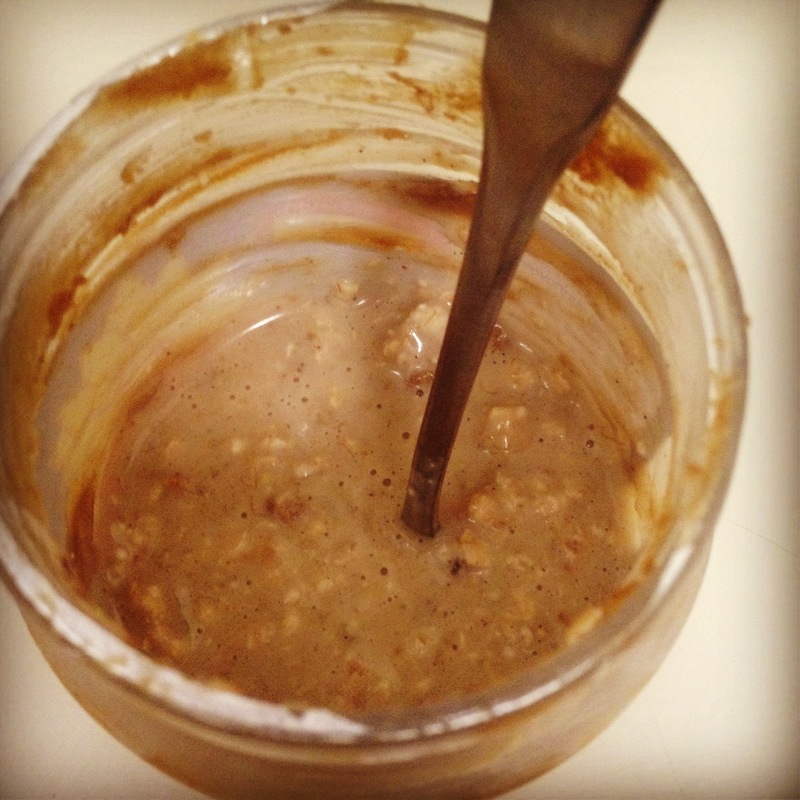 This morning I started in the usual way–with a spoonful of almond butter before hitting the gym. 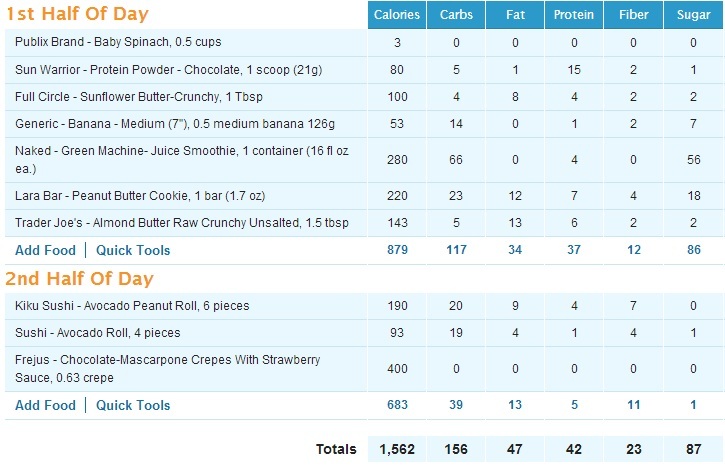 For my post-workout meal, I had a protein smoothie filled with kale, almond milk, sunbutter, banana, and Sun Warrior chocolate protein powder. 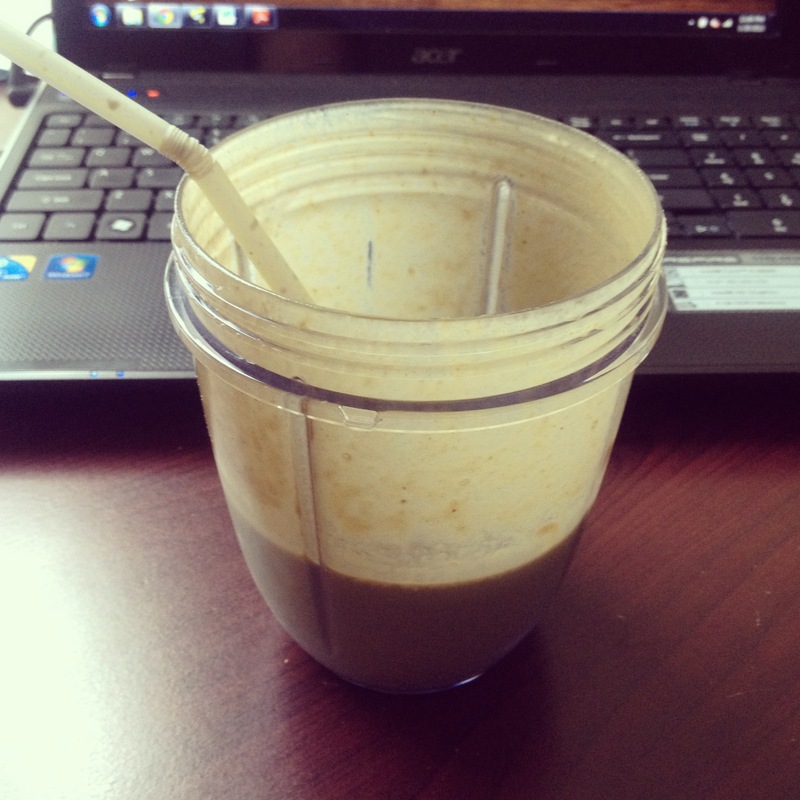 Yum…I look forward to this shake each day! 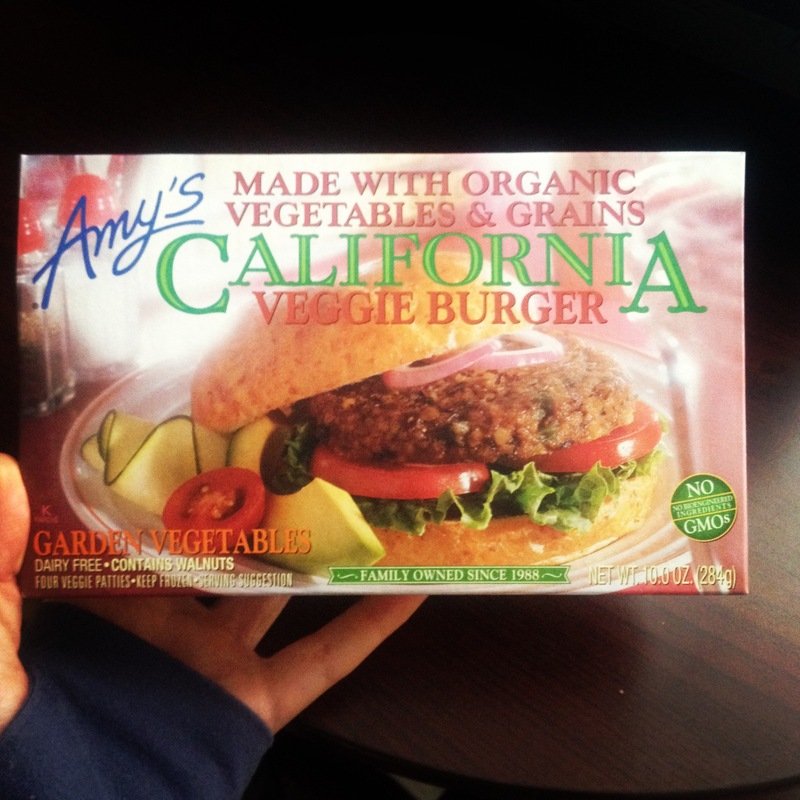 For lunch I tried a garden burger from Amy’s. 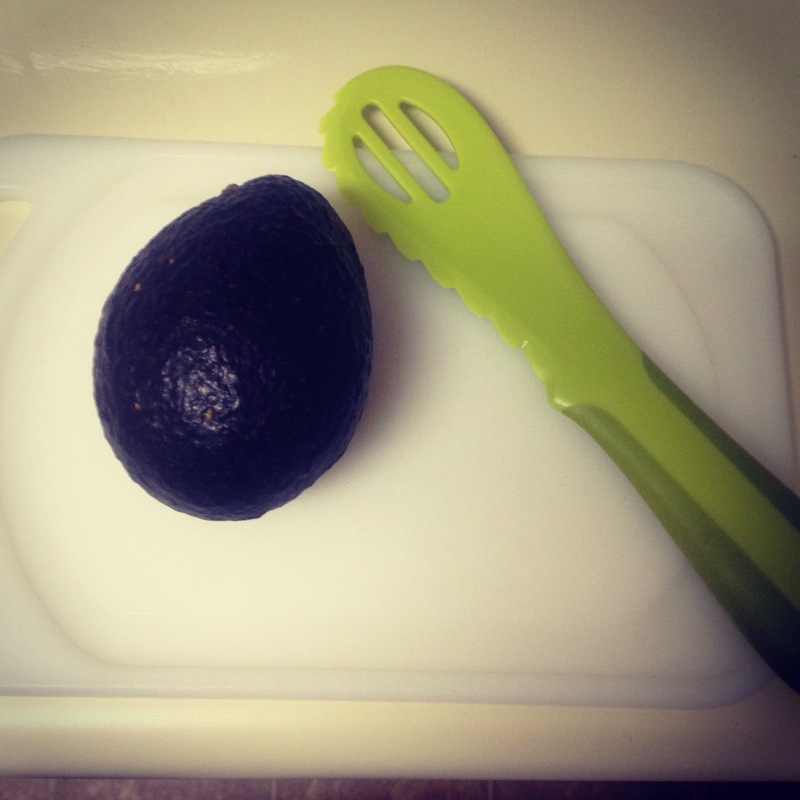 I had a ripe avocado laying around, too, so I used a fun, new tool I got for Christmas to slice it up. The end result was a tasty and satisfying lunch. A little while later I snacked on some raw carrots and hummus. Receive an email each time I blog!